With tour, a brewery bash and brewing these last few weeks, we haven’t had chance to do our weekly(ish) blog. So here’s your chance to read a little recap about what we’ve been doing these last few weeks. On the 22nd we had our first outdoor brewery bash of the year, hosted alongside our good friends at Goodtimes Tacos. The event was a pleasure as always to host and it was great to see some of your friendly faces drinking all of the beer. Our next bash is on Friday the 3rd of May from 5pm. Following the big clean up after the bash; Chris, Alex and Jack were hard at work brewing our entry for Newcastle Beer Festival’s ‘Battle of the Beers’ competition. Our entry this year is ‘Exam Room Tears’, a 5.5% maple and pecan stout. If you would like to get your hands on some find it pouring at the event this week. Stu Brew members can get free entry to the Wednesday and Saturday sessions with a valid student ID card. With 120 cask beers and 50 ciders pouring you’d be a fool to miss out! Alongside ‘Exam Room Tears’, we also have ‘Textbook’ our 4.5% IPA and ‘Copy and Paste’ our 5.0% cider pouring at the festival. Hopefully we will see you all there! Jack and Alex post brew day. As many of you may have already read, last weekend we had an awesome time in Brussels, if you’ve missed out on the action, catch Carey’s recap here. Next Saturday marks a year since this year’s committee was elected to their roles. We can honestly say it has been a blast of a year. Sadly, all good things must come to an end. This means it’s time for our AGM which is going to be held on Friday the 3rd of May (4-5pm) in Merz L101. 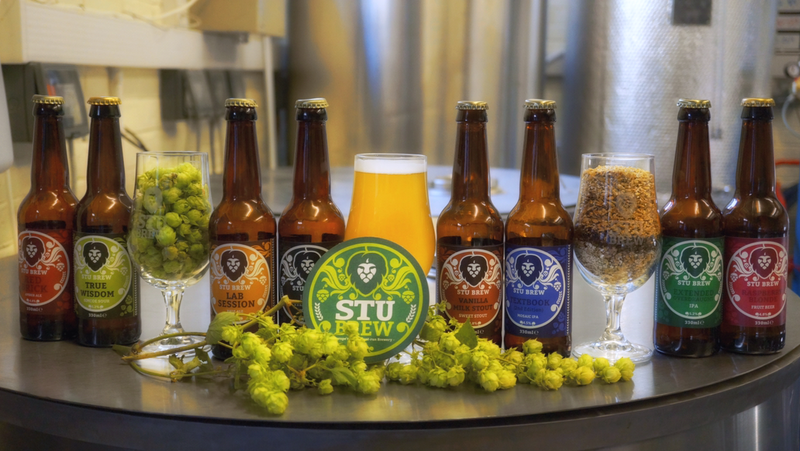 More information can be found on the Facebook event, but if you have any questions for now don’t hesitate to drop us a message on Facebook, Twitter, Instagram or email us at contact@stubrew.com. That’s all for this week – see you all at the beer festival!